There is a jar of money in the conference room of the Mooring Operations & Engineering (MOE) team at Woods Hole Oceanographic Institution. It is a United Nations kaleidoscope of bills and coins that MOE team members didn’t have time to convert back to U.S. currency before returning from one of their many assignments around the world. Members of the team are often called upon, sometimes at the last minute, to fly to an exotic port of call, hop on a research ship, and help deploy miles of mooring lines in remote corners of the ocean. Before they head to the airport, team members can make withdrawals from the jar so they will have enough local currency for a meal during a layover or a taxi to town when they reach their destination. On a recent afternoon, someone had riffled the contents for a few Norwegian kroner—maybe enough for a beer before turning in after a long day of travel. Until about two years ago, the jar contained no money from the countries bordering the Southern Ocean at the bottom of the Earth. That changed when the ocean science community began to achieve its long-sought goal of establishing long-term outposts in the ocean to collect sustained, round-the-clock data. The National Science Foundation’s (NSF) Ocean Observatories Initiative (OOI) included four nearly identical sets of instrumented moorings with autonomous underwater gliders in critical, high-latitude locations: the Irminger Sea off Greenland; the North Pacific off Canada; the Argentine Basin off the southeast coast of Argentina; and the Southern Ocean southwest of the tip of South America. In their quest to establish a sustained monitoring presence in the ocean, the ocean science community in 1988 created two observatories to gather data around the clock and over extended periods of time: the Bermuda Atlantic Time Series (BATS) and the Hawaii Ocean Time-series (HOT). But these were in the generally placid subtropics. The following year, scientists went a step further and put a long-term mooring off the coast of Iceland, but it was lost within a few months when the rough sea generated forces on the mooring line beyond anything the engineers had anticipated. 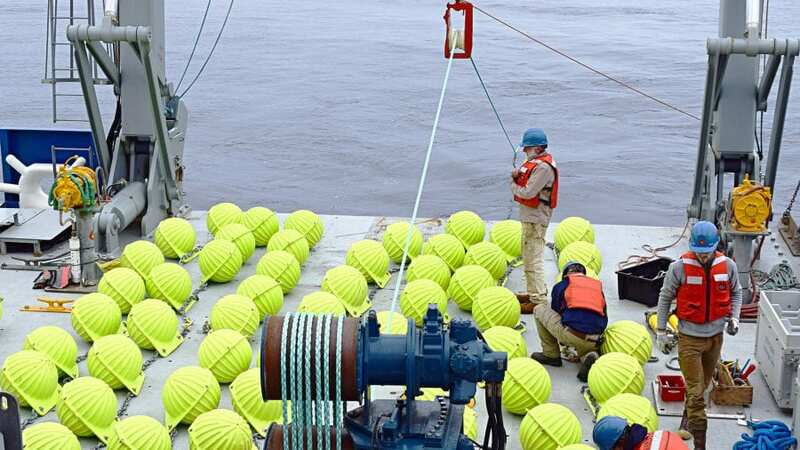 In 1994, researchers from WHOI, Lamont-Doherty Earth Observatory, and the University of California Santa Barbara tried again, this time deploying an array of five moorings in the Arabian Sea. It was part of a yearlong project to study the relationship between the upper ocean and the Asian monsoon, whose rains help feed nearly one billion people. 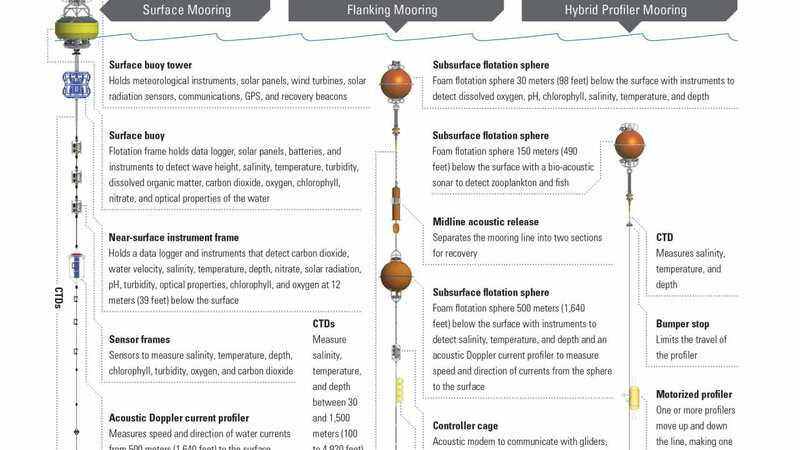 One mooring at the center of the array carried 32 instruments to measure temperature, salinity, currents, dissolved oxygen, chlorophyll, and light transmission and intensity in the ocean—an unprecedented amount and diversity of data at the time. 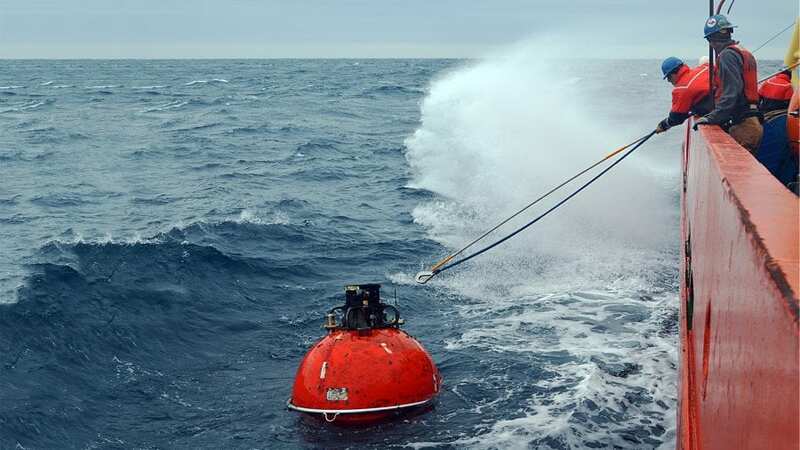 The mooring also included a surface buoy with meteorological instruments to study the interplay between air and sea and communications equipment that sent data to shore via satellite. The data were also made freely available to the public on a website—another first. In a nod to the lessons of Iceland, the designers had reinforced the central mooring and saw it survive a beating from waves kicked up by monsoon winds that exceeded 40 miles per hour. The community was ready to make long-term ocean observing a reality. 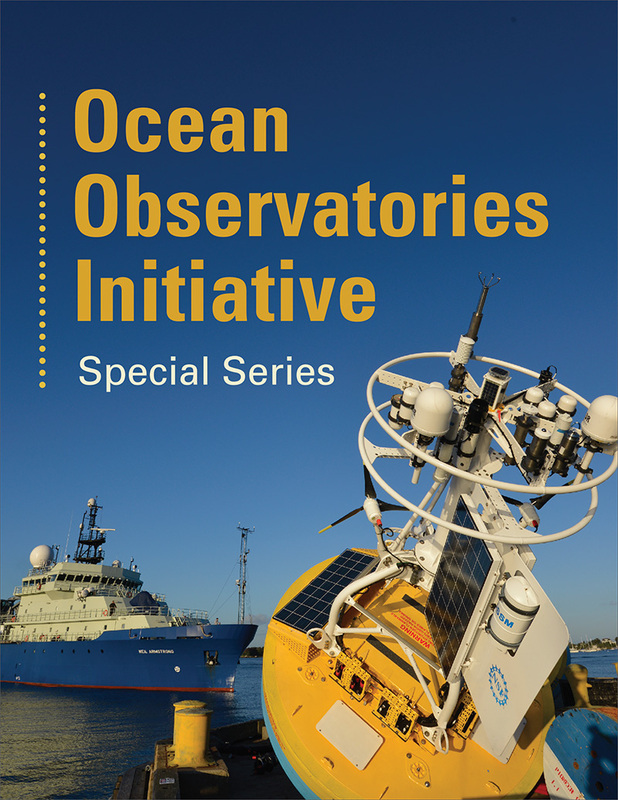 In the late 1990s and early 2000s, ocean scientists and engineers laid the groundwork, first to bolster arguments in favor of a sustained observing presence in the ocean, and later, as support grew, for what a robust series of ocean observatories should do, how they should be designed, and where they should be located. 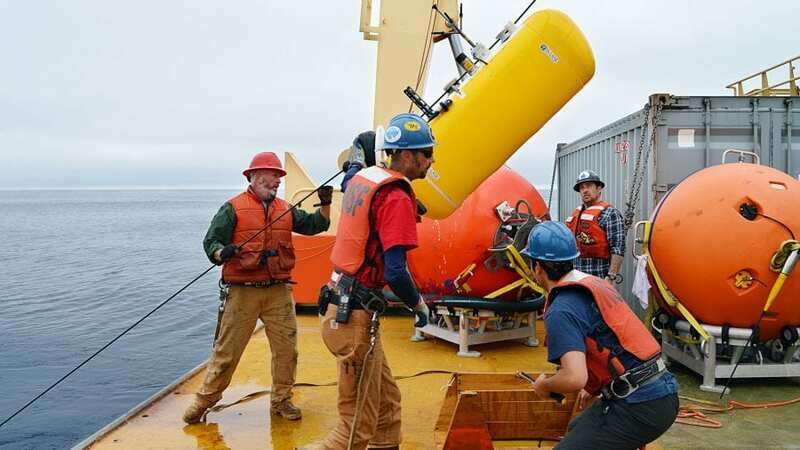 The scientists saw the need for the instruments to provide the widest possible range of different measurements to look at ocean processes from the atmosphere to the seafloor over wide areas and long time periods—decades, if possible. In 2006, the NSF gave the go-ahead to launch the Ocean Observatories Initiative, a $386-million project to build and deploy three types of ocean observatory systems and maintain them for 25 years: Two Coastal Arrays off the U.S. East and West Coasts would focus on coastal ocean dynamics and ecosystems, a Cabled Array off the Pacific Northwest would focus on geophysical and biogeochemical phenomena, and a set of Global Arrays would create a sustained presence in the aqua incognita. In the undersampled high-latitude regions, crucial processes play out that have impacts on air-sea exchanges of heat and carbon dioxide, Earth’s climate, the global circulation of the ocean, and ocean ecosystems—all of which, in turn, may be disturbed by the impacts of a warming planet. In addition, the location of each Global Array is designed to fit into other international efforts to monitor ocean processes far from shore. The array at Station Papa in the Northeast Pacific, for example, takes advantage of a site that has been monitored and sampled for decades by both the United States and Canada and includes pre-existing instruments and infrastructure into its design. 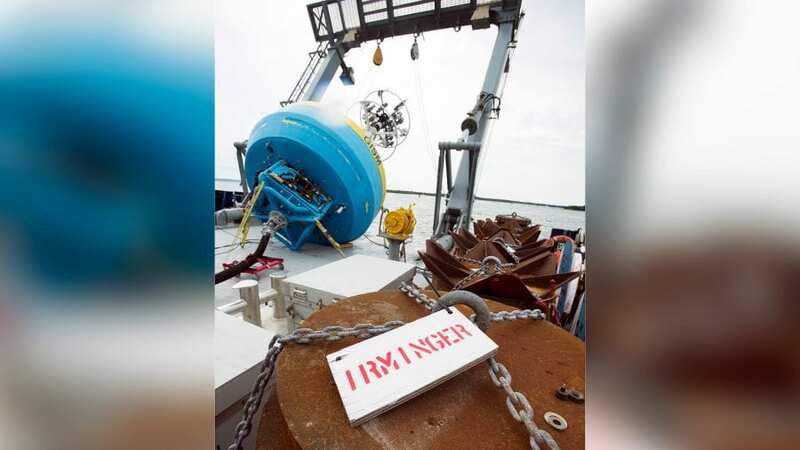 The Irminger Sea site selected by OOI is near another long-term monitoring effort operated by a U.S.-United Kingdom-European consortium known as OSNAP (Overturning in the Subpolar North Atlantic Program) and was designed to fit into the OSNAP mooring network. “We sorted it out to give us the best bang for the buck,” said Weller, who also helped lead the 1994 Asian monsoon study. Each Global Array is laid out in a triangle roughly 12 to 30 miles (20 to 50 kilometers) on each side in water ranging from 8,900 to 16,400 feet (2,700 to 5,000 meters) deep. At two corners of each array are flanking moorings that hold instruments down to 4,900 feet (1,500 meters). 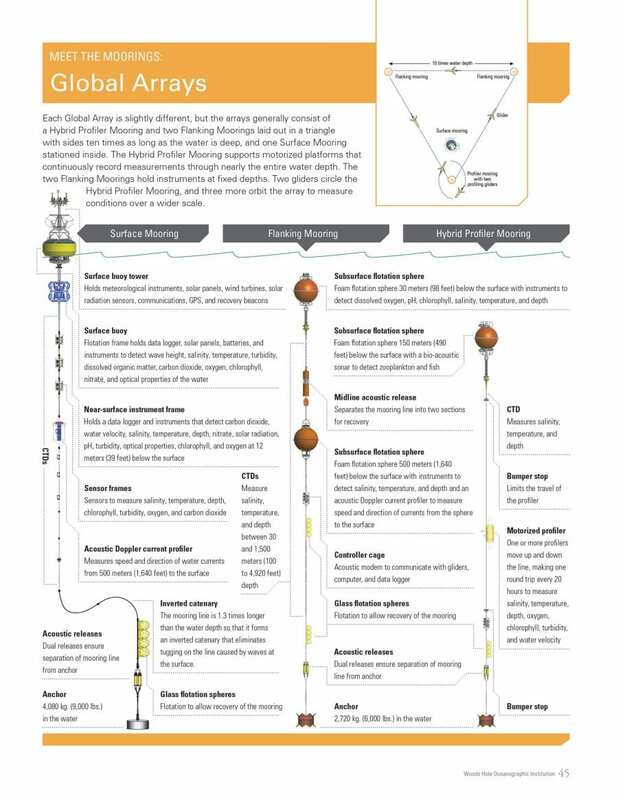 At the third corner of the triangle is a mooring with one or more autonomous profilers, which move up and down the mooring line once or twice a day from depths of 560 feet (170 meters) to near the seafloor. Three moorings simultaneously measuring conditions over a broad area offer a bigger picture than a single ship visiting once or twice a year could provide. The configuration and spacing allow scientists to monitor and record the development of relatively localized phenomena in the ocean such as phytoplankton blooms and eddies—swirling water masses that sometimes break off from large currents—that can have a measurable impact well beyond their relatively limited footprint. Eddies can affect the physics, chemistry, and biology of the ocean across hundreds of miles and influence the weather even farther afield. 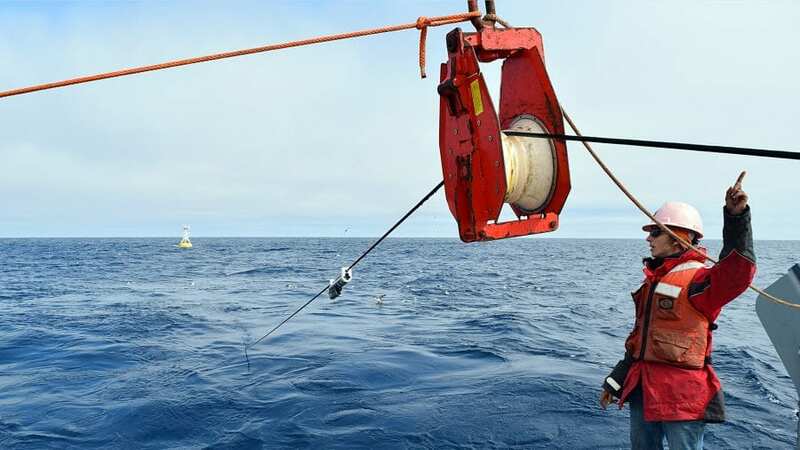 And while the profiler mooring provides a detailed view through the water column of a single location, a pair of autonomous profiling gliders orbits nearby to provide a similarly high-resolution look at the top 656 feet (200 meters) of the ocean. At the same time, another pair orbits the entire array to provide a wider ocean view. These gliders and other parts of the Global Array can be reprogrammed from shore to gather measurements of an unexpected event or change in conditions. The gliders also solve a dilemma for the Global Arrays of relaying data back to shore from beneath the surface. Unlike Coastal Array moorings, almost all of the elements of Global Arrays are submerged and so incapable of communicating with shore. 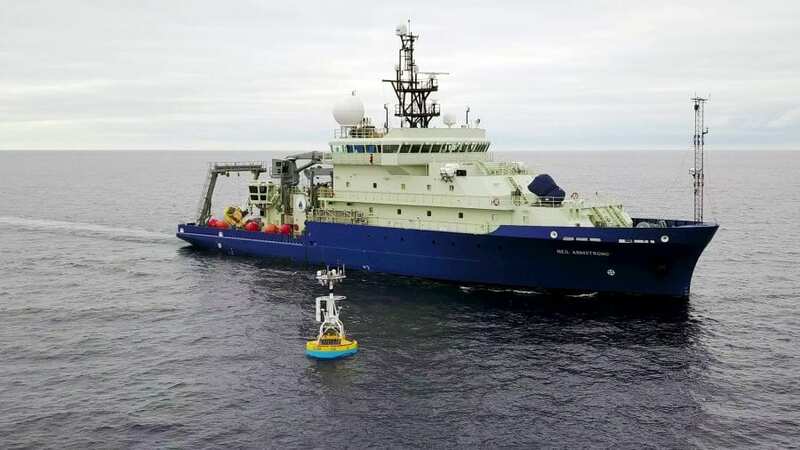 But when underwater gliders circling the array get close to a mooring, they download data from the mooring through the water via an acoustic modem, surface, and transmit the data to a satellite. The data are then made available to scientists and the general public on the OOI website. The sole component of a Global Array on the surface is a buoy near the profiling mooring. It is one of the most instrument-heavy platforms ever put in the ocean. In addition to sensors fastened along the mooring line itself, the surface buoy holds sensors that monitor conditions immediately below the surface, including water temperature and salinity; nitrate concentrations, dissolved oxygen, and carbon dioxide; and biological activity. It also supports a meteorological station that records a range of atmospheric conditions so that scientists can better understand how the ocean and atmosphere interact over time. 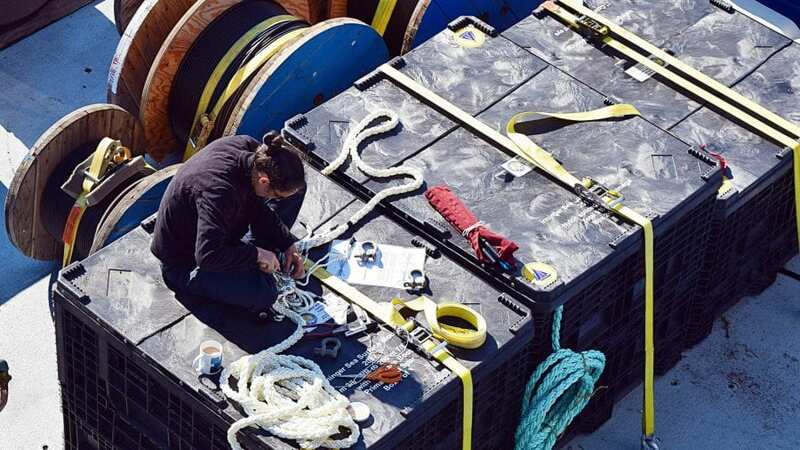 Added to that is communications equipment that relays data back to shore in near-real time, and wind turbines, solar panels, and rechargeable batteries to power the instruments day and night. In addition, it has reinforced construction to enable everything to stand up to whatever the high-latitude oceans can throw at it over the course of a year. All of this adds up to a platform that weighs four tons and is unprecedented in its size, complexity, and durability. In the summer of 2013, the first Global Array was deployed, at Station Papa. It was followed in the fall of the following year by the Irminger Sea Array and, in the spring of 2015, by the arrays in the Southern Ocean and Argentine Basin. Maintaining a year-round presence in the ocean is anything but simple—or inexpensive. Originally conceived in an era of brighter budget outlooks, all four were envisioned to operate for decades. But each trip to one of the Global Arrays requires nearly 20 shipping containers full of equipment to be staged from a distant port. Even when an expedition is compromised by bad weather, just making the effort to travel to remote and seldom-visited parts of the ocean has paid dividends. In 2015, WHOI physical oceanographer Sebastien Bigorre was the chief scientist on the first cruise to recover and replace the moorings in the Southern Ocean—to “turn” the moorings, as it is called. Faced with 33-foot (10-meter) waves, Bigorre decided not to have the ship wait out the storm near the moorings, but instead chose to travel even farther south to gather whatever data that conditions would allow from the edge of the vast Circumpolar Current that sweeps unobstructed around Antarctica. Occasionally, the current sheds mammoth eddies that travel hundreds of miles and affect everything from the deep ocean to the atmosphere. 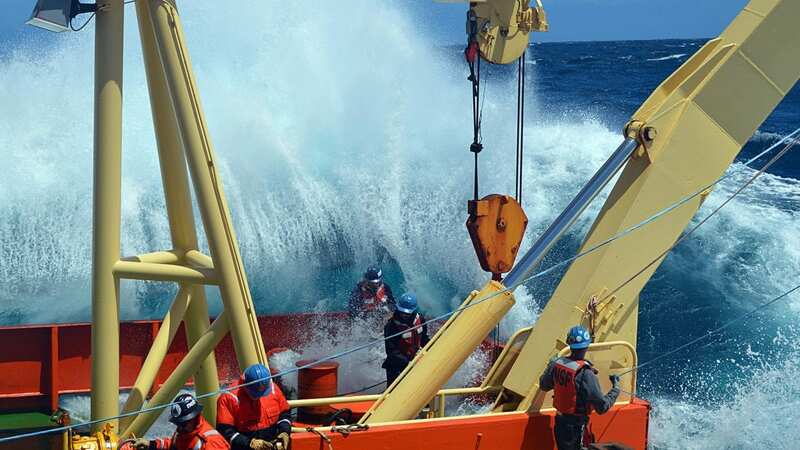 Last year, Bigorre returned to turn the Argentine Basin Array and encountered two storms that halted work, plus a third that the ship was able to dodge while returning to port, but not without sailing through 70-knot winds. That set his mind to work—the strong currents he sees sweeping through the array and the fierce winds on the ocean above must be linked.